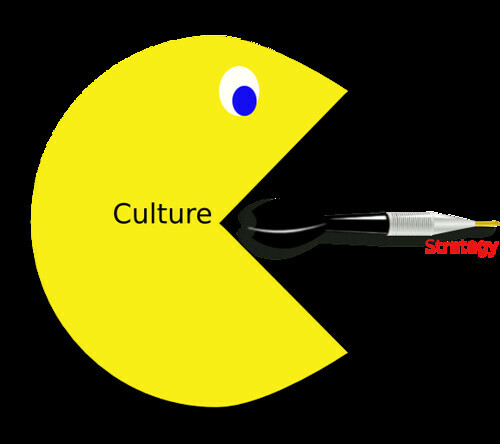 Strategy - successful strategies need supportive cultures. How do our artifacts describe us? What artifacts actively attracts people to use our services? What artifacts actively discourage success? how is the vision made evident throughout all of our activities? is the vision and mission persuasive? how do our projects cross support and benefit each other? how do project leaders co-educate each other and what artifacts demonstrates a culture of co-learning? Is our unit a skilled team or a unit of skilled individuals? how are achievements (both small and large) celebrated? how adaptable is our business unit to change? Business units who are charged with innovation, change of practice and emergence must contend with many complex cultural artifacts across many sites. This includes working with other business units, divisions and (in the case of education) school sites. It is important to have a persuasive business culture and a belief in our services, if we are to influence other site cultures. Simon Sinek: How great leaders inspire action through purpose (read more). Have a strategy and plan. Believe in what you want your clients to believe in. Strategies that involves innovation, change of practices and emergence will require elements containing conflict and common interest. Look forward and reason backwards. If you have a dominant strategy use it. Eliminate oppositional dominant strategies from consideration (if it is doesn't support the purpose). Look for equilibrium if other strategies are beneficial and supports the purpose. Most people will think only one or two steps ahead (strategic steps to what they want). They will not have a clear purpose, sufficient strategic steps and explicit targets to achieve what they want. Good strategists need to know what steps are required to achieve the explicit want. Good strategist plan three, four and if needed five steps ahead.